I decided to give my own take on the Bloody Mary. More and more bartenders are trying it with beer instead of vodka, and that’s what I’ve done here. 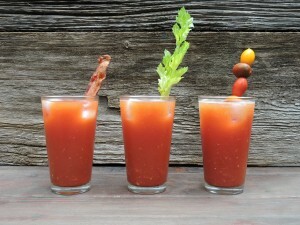 I can say, without question: I like this Bloody Brewski more than I like a Bloody Mary! It has a lighter body with all the flavor. It’s a perfect daytime summer drink I think you’ll really enjoy. I am really intrigued and excited about what mixologists are doing with beer these days. The idea of mixing beer into a cocktail isn’t new, but still seems to be reserved for bars and restaurants – not a lot of people have been trying it at home. I’m here to tell you, you need to! Fill two pint glasses a little more than halfway with ice. Equally divide the contents of one bottle of beer into both glasses. In each glass, pour a can each of tomato juice. Divide the cocktail sauce, Worcestershire, and hot sauce. Stir and then top with a pinch each of of ground black pepper. Add your garnish of choice. Serve. Makes 2 drinks.